Hypoallergenic TROVET (Deer) is a complete dietary food in case of food intolerance. Food intolerance means that your dog reacts (in excess or allergic) to certain ingredients in foods. Food intolerance is easy to treat with special diet foods that contain no (specific) ingredients that your dog does not tolerate. Food intolerance is diagnosed based on the results of an exclusion diet. An exclusion diet, also called 'hypoallergenic', contains only one source of protein and a source of carbohydrates, which are known to rarely cause intolerance reactions. 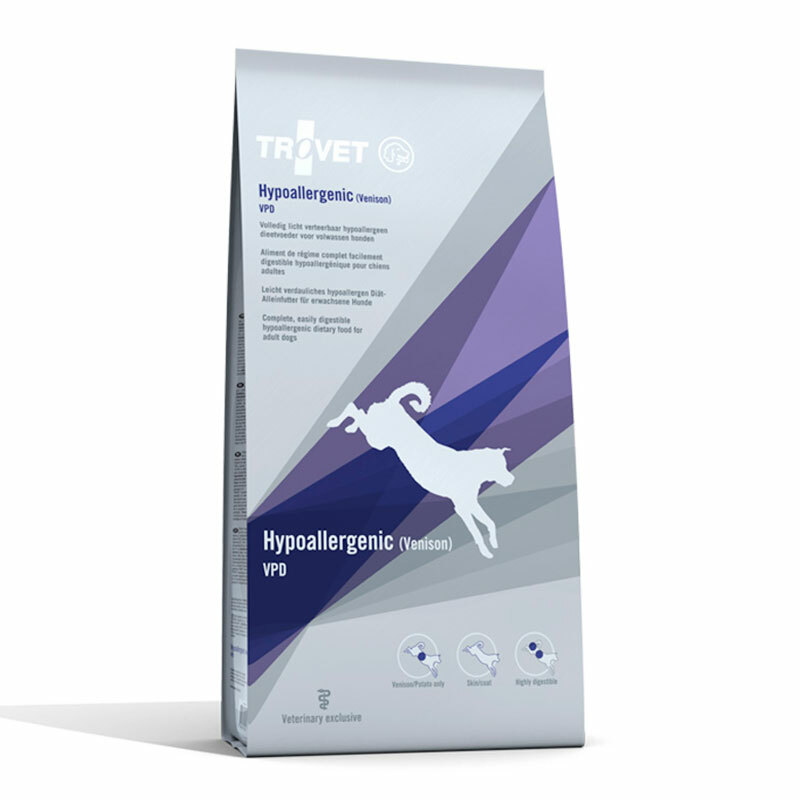 Hypoallergenic TROVET (Hart) contains a single source of protein (deer) and a single carbohydrate source (potato). An exclusion diet given to the dog as only food for approximately six weeks. Not all symptoms will diminish or disappear immediately. For example, skin conditions slowly improve. When symptoms dissipate or disappear, then you can diagnose food intolerance. • Food hypoallergenic diet based on a source of protein and carbohydrates (deer and potato). • Prevents immunological reactions (food allergy) or non-immunological reactions (food intolerance) as skin problems and / or digestive problems (diarrhea, vomiting). • Changing to a hypoallergenic diet will help to slowly reduce associated itching and preventing secondary skin lesions caused by scratching, rubbing and gnawing. • Complaints about food hypersensitivity are quite common and nonspecific. • Hypoallergenic TROVET (Deer) contains absolutely essential food components in optimal amounts. Deer and potatoes only rarely causes allergic reaction. The optimum ratio of Omega 3/6 circulatory reduces inflammation and improves the conditions of the skin and hair. The potato as a source of carbohydrates is easily digestible. The recommended duration for using TROVET Hypoallergenic (Hart) is 3 to 8 weeks at first. When the hypersensitivity symptoms disappear, TROVET Hipoalergéncio (Deer) can be used as a complete dietary food for life. The rigorous monitoring of the dietary prescription is very important.